On Friday 18th April 2008, the thirty-seventh Scottish and Northumbrian Academic Statisticians' Meeting will take place in the Department of Mathematical Sciences of Durham University. The Department is easily accessible by bus, taxi or foot from the railway station. The registration fee is £35 which includes coffee, lunch and afternoon tea. Reduced rates are available for students and for those who do not wish to take lunch. If you wish to attend the meeting, please read the registration section below and complete the registration form as soon as possible. The programme for the meeting is shown below; the venue will be CM101 in the Department of Mathematical Sciences, Durham University (marked 15 on the map). Accounting for, and analysing, all the sources of uncertainty that arise when using a complex model to describe a large scale physical system is a very challenging task. I will give an overview of some Bayesian approaches for assessing such uncertainties, with particular application to problems of model calibration. The approach will be illustrated with an application concerning the calibration of a Galaxy Formation simulation against various observational features drawn from Galaxy Surveys. There is an increasing quantity of road transport data that is becoming available. Both historical archives, in some cases consisting of decades worth of data, as well as new types and sources of data are being made available. In the future we can expect these new forms of data to be available in near real-time. What uses can be made of this data? In this talk we shall illustrate how road traffic data is helping modellers grapple with the nature of traffic flows and congestion. New forms of data are also an opportunity for service providers to assist travellers and transport operators. We shall consider a specific application where historical data can be combined in a statistical model with real-time traffic data to make better predictions of journey times. Surprisingly, our findings suggest that good prediction tools can be constructed that have rather modest online requirements. Astronomy is a data-driven discipline. It seeks to describe and explain the observable universe within the framework of physics. In doing so it has revolutionized parts of science, famous examples being nuclear fusion (the reactions which power the sun and all stars) and the apparent existence of large amounts of dark matter (inferred from observations of stellar motions). We cannot experiment with the universe: we can only learn by observing, modelling and interpreting data. Surveys, then, which reach fainter objects, higher spatial resolution, new wavelength regions and higher precision, are astronomy's lifeblood. Surveys routinely now observe billions of stars and galaxies, measuring positions, velocities, colours and spectra. Modelling, interpreting and understanding these heterogeneous, multidimensional data sets is a huge challenge, and relies on efficient nonlinear algorithms for classification, regression and clustering. I shall give an overview of the challeneges in this area facing the upcoming Gaia Galactic survey mission. I shall present some techniques (standard and novel, statistical and heuristic) which the scientific community is using to address these challenges. Lunch will be provided by a local Thai restaurant (Zen) 15mins walk from the Maths Department. Lunch will consist of a soup starter followed by a choice of meat or vegetarian main and comes with one soft drink. Those who wish to make their own lunch arrangements can pay a reduced registration fee. This event is intended as a day meeting, and therefore we do not offer any overnight accommodation. If you are planning an overnight stay, then information on suitable accommodation (en-suite rooms, B&B, in Durham colleges) is available here. All colleges offer suitable accommodation, if you wish a recommendation then we would suggest Collingwood College. 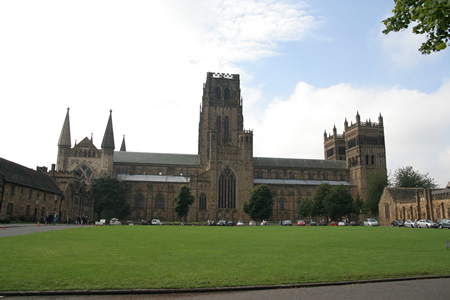 More information about travelling to Durham can be found here and here. A useful map can be found here, where the Department of Mathematical Sciences is marked (15). Car parking at the Department of Mathematical Sciences is in extremely limited supply. For those arriving by car, it will be possible to obtain a day-permit at the entrance barriers - however this is no guarantee that you will find a place. A preferable alternative would be to use the Durham Park and Ride at the nearby Howlands Park site which offers a large supply of secure parking. The registration fee is £35 which includes morning coffee, lunch and afternoon tea. A reduced rate of £25 is available to students. For those who wish to make their own lunch arrangements a further reduced rate of £25 and £15 is available for non-students and students respectively. Full payment instructions are given on the invoice form. If you have any questions, please contact Jochen Einbeck via email, or telephone (0191) 3343125.